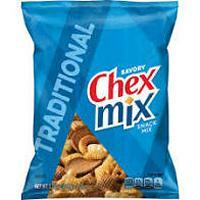 The original Chex™ you love! It’s corn Chex, wheat Chex, pretzels, rye chips and mini breadsticks combined with a unique seasoning blend for a one-of-a-kind snack. It is very good, today and every day. Love Love Love Chex mix. My family really enjoys all the flavors of Chex Mix. I like to set bowls full of our favorite snack out on the tables when the kids are here to swim. It's a treat we all enjoy. Good to use at my dollar general. I love Chex Mix. Especially when a coupon is used on top of a store's discount.